Hello everyone! We are excited to hop with our friends at Chameleon Pens today! To make it easy for you, the hop is between the two of our company blogs. Ready for some awesome inspiration and great prizes? Hop along! If you are new to Chameleon Pens, they are innovative alcohol based markers to help you create stunning 3D effects, smooth transitions, highlighting, shading, gradations and blending all with one pen! We have Tessa here today with a video for you! Hi everyone! Tessa here! The flowers in the Potted Stamp Set focal image were just perfect for trying out the Chameleon Markers. I picked some pretty colors and tried them out with a few different techniques. They were so easy and coloring with them truly was mesmerizing! They were very beginner friendly and the range of colors is very nice. I kept my card design simple so that the colors would really stand out! Just a little vellum and silver thread as embellishment. I cut out around part of the image so it looks like it is hanging over one side. Find time to create and make something today! Hello everyone! Waffle Flower friend Sveta Fotinia is sharing with us today! Hello everyone! Today I'm honored to share a card and a video on Waffle Flower blog. In the last few months, me, my husband and our pretty cat have been waiting on the reconstruction of our apartment to finish. We can't wait to move in and have a real party with our friends. 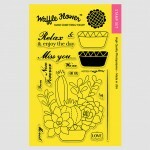 I want to make some invitations and Potted Stamp Set is perfect for this occasion. 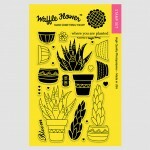 Especially that I plan to decorate my new home with lots of succulents! I blended a circular background using distress ink and then stamped the succulents on top with Stazon ink. 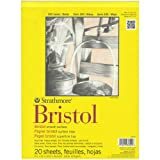 You can also use heat embossing for this technique. You just need your image to be water-proof. As you may have known that distress ink can be reactivated by water, I used water to lighten up selected petals to add contrast to the succulents. I also added some shimmer to the "bleached" areas using a Wink of Stella brush. This is a super fun way to color. I used white embossing powder on black cardstock for my sentiment. I trimmed the ends of the sentiment strip to make it look like a pointing arrow for added movement on the card. Close to the end of the video, I added invitation text inside with our new address. That's it! Watch it below or on Sveta's youtube channel. Hope you liked my card and will find this video usefull. Thanks! - Sveta Thank you so much for sharing with us today, Sveta! This is such a cool technique, we can't wait to give it a try! Find time to create and make something today! Hello everyone! Welcome to another Watch It Wednesday! In this video, Waffle Flower design team member Tessa shares how she incorporated different media on this adorable mini canvas project. Potted Stamp Set Planted Stamp Set Thank you for sharing with us today, Tessa! You are amazing! Congrats winners! Please send your choice of a stamp set along with your snail mail address to: Thank everyone for joining us! We look forward to seeing your creations in our Current Challenge! I really love this month's Photo Inspiration! It's pretty obvious by looking at my card that I was inspired by the trio of pots (I even did a little masking to layer the succulents and pots), but I was also drawn to the strong horizontal lines in the photo. I wanted to add a little drama to my cacti, so I added the stamped patterned paper on the right (I used the new Pattern Play stamp set) and the little sprinkling of inky dots on my main stamped image to tie everything together. I can't wait to send this card to a friend! (Other stamps sets used: Potted and Planted). Thank you for stopping by! Join the fun by linking up your project(s) here! Hello everyone! Nina here! I'm very excited to share today's video. I took a ZIG class a few weeks ago and fell in love with their Clean Color Real Brush. These brushes make color blending easy! 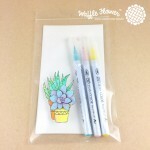 I found that these three colors are perfect for coloring the succulents from our Planted Stamp Set and Potted Stamp Set! The colors are so clean and pretty! 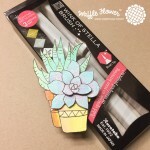 This Succulent Color Blending Kit includes three pieces of 4"x7" Bristol paper needed for this technique. Watch it below or in HD on Youtube. http://youtu.be/Uc9La_xmRck Aren't they fun? Here is my finished card. Sentiment from In Every Way. I added the dimension with foam adhesives. I also added Wink of Stella Gold glitter for some messy free shimmer! I had so much fun playing with these products. I hope that you are encouraged to color a few things too? Thank you for stopping by! Happy Crafting! After this bubbly feast, I wanted to try my hand at stamping some bubbles. With the new Shower stamp set you get all the fun but none of the mess! I couldn’t resist placing the little bunny from Riverside stamp set having a blast with the bubbles inside the bathtub. A polka dot strip from Pattern Play stamp set was perfect to ground the images and makes a fun bath rug too. The sentiment comes from Potted stamp set. I just thought it was perfect for this card! I’ve posted a few more details about this card on my blog. Have a fantastic weekend! _______________________________________________________________ Thank you for sharing with us, Lorena! We just fell in love with that little bunny again! While I love everything about this month's Photo Inspiration, it was really the colors that I decided to focus on. This trendy mix of colors is not one that I would normally put together, but hey! I guess that is why this is called a challenge, right? The avocado green color immediately brought to mind our new Potted Stamp Set, so cute! After coloring the succulents, it was easy to add in the warm rose color in the title and cacti flower and accent the set with a dash of pretty blue and purple. This is my first attempt at tackling the "multiple layered die cut" effect on my title and I love how it turned out! Not to mention that the Perfect Word Die is, um, pretty perfect! Thanks for taking a peek at my challenge card! Add the link(s) to your project(s) to the Link-up Tool at the end of this post! We will draw a random winner from all entries for playing along. You can enter as many times as you want! The winner will receive a stamp set of choice! The Challenge team will vote for another winner to join us in a future challenge! We look forward to seeing your projects! Thank you for stopping by! Happy Crafting! Hello everyone! Welcome to day 2 of Waffle Flower Crafts Winter 2015 release! With Valentine's Day and Spring in mind, we've gone back to basics with our winter 2015 collection. Whether you are a trend watcher or a collector of unique designs, we have you covered! We will introduce 10 new stamp sets and 6 new dies from Jan 1 to Jan 5 with all products available in our store as well as many of our retail partners on Jan 5. [divider] I have to admit that I can be particular about flower images. We invited Mia Charro to illustrate today's images and I am totally in love! Succulents and pots, anyone? We've made them into 2 stamp sets and 1 die for this release! The sentiments and images on both sets are interchangeable and works well with each other. Simple stamping: Coloring: Paper Piecing: Or you can just stamp the outline to create a beautiful subtle background for your project! Have fun using the coordinating Pots Die! Perfect for colored or patterned paper background! Remember that you don't need to use the entire image on a card? Can you tell that the design team has been having fun with these sets? We hope that you will too! Thank you for stopping by, everyone! We are going to have videos and tutorials throughout the month to share more ways on using these products. See you tomorrow for more new sets! All products will be available in our store as well as many of our retail partners on Jan 5.